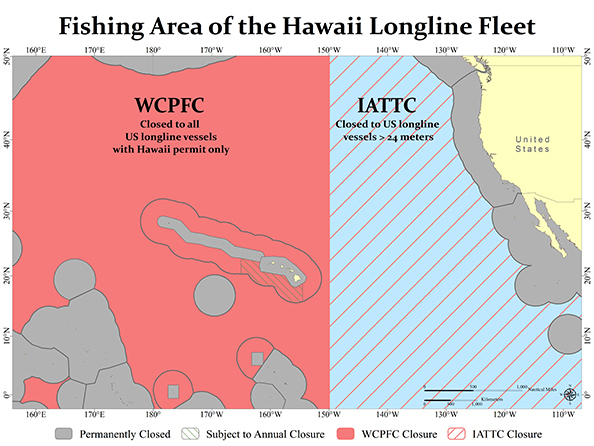 HONOLULU (08 Oct. 2015) For the past two months, since early August, about a quarter of the 145 active vessels in the Hawaii longline fleet have been prohibited from catching their target species, bigeye tuna. 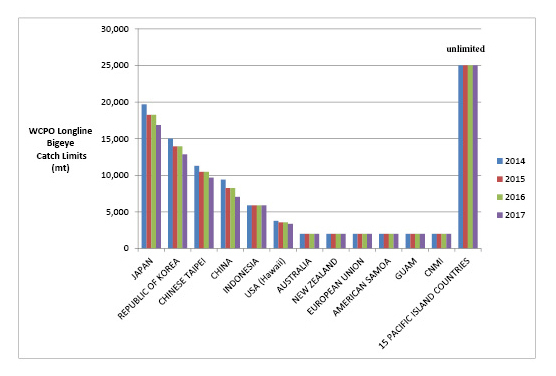 Arbitrary quotas not linked to conservation objectives are keeping them tied at the docks. These struggling vessels and small businesses they support are accumulating millions of dollars in debt each month, causing untold anxiety for the local fishing community and consumers. The rest of the Hawaii fleet has been forced out of its primary fishing grounds in the Western and Central Pacific and must travel more than a thousand miles into the Eastern Pacific to set hooks to catch bigeye tuna. This travesty has happened because of two international quota systems-one in the Eastern Pacific for larger longline vessels and another in the Western and Central Pacific for all longline vessels. Both allocate the United States a minuscule amount of bigeye tuna. As a result, industrial foreign fleets, with much higher bigeye tuna quotas, freely operate on the high seas around the Hawaiian Islands where Hawaii longline fishermen can no longer fish for bigeye tuna. Overfishing of bigeye tuna in the Pacific started when the purse-seine fleets began using fish aggregation devices. While fishing on FADs targeting skipjack tuna for canneries, the purse-seiners unintentionally catch more bigeye than the longline fishery. The Hawaii fishery lands only 1 and a half percent of the bigeye tuna caught in the Pacific Ocean. 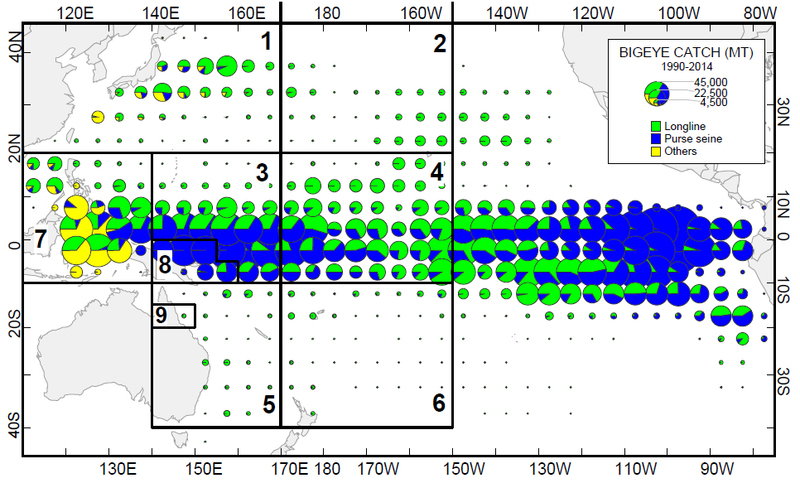 Its fishing grounds are thousands of miles away from the equatorial Pacific, the epi-center of overfishing. The Hawaii longline fishery is unique. The fish are packed in ice and brought fresh to the dock for mostly Hawaii consumption. Imported tuna, on the other hand, are mostly frozen. They are transshipped at sea with little monitoring and little traceability. These tuna are often treated with carbon monoxide, giving them an artificially fresh appearance. The Western Pacific Regional Fishery Management Council played a key role in establishing the international Western and Central Pacific Fisheries Commission in 2000. 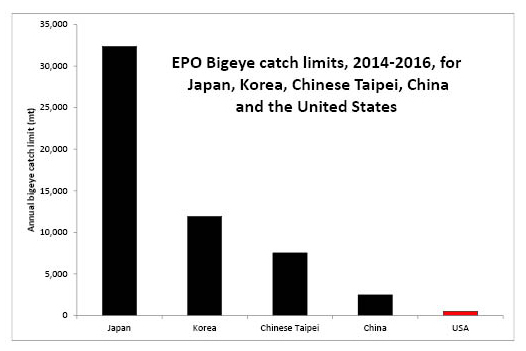 The Council supported the Commission’s goals to prevent overcapacity and to eliminate bigeye overfishing in the Western and Central Pacific. However, the Commission has conspicuously failed to address these critical issues. Instead of being penalized for a problem it did not create, the Hawaii longline fleet should be rewarded for being an exemplary fishery. The Western Pacific Council under the Magnuson-Stevens Act has responsibly managed this fishery for decades. The fishery has maintained high levels of observer coverage, provided quality fisheries data for stock assessments, pioneered the vessel monitoring system and mitigated protected species interactions. The five Commissioners who will be representing the United States at the next Western and Central Pacific Fisheries Commission will be meeting next week Wednesday and Thursday to strategize for the Commission’s next meeting to be held Dec. 3 to 8, 2015, in Bali. The US government must commit to protect the Hawaii longline fishery. The alternative is US dependence on foreign imports and the irrevocable loss of Hawaii’s iconic fishery. Western Pacific Regional Fishery Management Council: Appointees by the Secretary of Commerce from nominees selected by American Samoa, CNMI, Guam and Hawai`i governors: Michael Duenas, Guam Fishermen’s Cooperative Association (Guam) (vice chair); Edwin Ebisui (Hawai`i) (chair); Michael Goto, United Fishing Agency Ltd. (Hawai`i); John Gourley, Micronesian Environmental Services (CNMI) (vice chair); Julie Leialoha, biologist (Hawai`i); Dr. Claire Tuia Poumele, Port Administration (American Samoa); McGrew Rice, commercial and charter fisherman (Hawai`i) (vice chair); and William Sword, recreational fisherman (American Samoa) (vice chair). Designated state officials: Suzanne Case, Hawai`i Department of Land and Natural Resources; Dr. Ruth Matagi-Tofiga, American Samoa Department of Marine and Wildlife Resources; Richard Seman, CNMI Department of Lands and Natural Resources; and Matt Sablan, Guam Department of Agriculture. Designated federal officials: Matthew Brown, USFWS Pacific Islands Refuges and Monuments Office; William Gibbons-Fly, US Department of State; RAdm Vincent B. Atkins, US Coast Guard 14th District; and Michael Tosatto, NMFS Pacific Islands Regional Office. Click on the link to see the press release by PRWEB http://www.prweb.com/releases/wprfmclongline/release/prweb13015272.htm#!